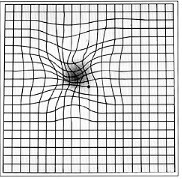 Have you been instructed by your eye doctor to check your vision daily with the Amsler Grid? Do you wonder what to look for and if indeed you can detect any small or big changes in your vision? Suzanne went to see her retina specialist on November 17,2011. Her doctor found no evidence of wet macular degeneration during this exam as confirmed by an OCT image. Just days later, on November 23, 2011, Suzanne's home monitoring device triggered an alert, indicative of a statistically significant change in her testing results. Keep in mind, she had just visited her retina specialist and had no signs of wet AMD. Although she had no symptoms, upon receiving the alert, she scheduled an appointment with her retina specialist, where he confirmed the early development of wet AMD and began immediate treatment.